For the full rules for this event, please see the Boost Glider Duration Rules in the Model Rocket Sporting Code. The contestant may make one or two flights. Up to two models may be used. The score is the sum two flights, as long as one of the gliding portions is returned. Pop-Pods. Nearly all B/G’s use pop-pods. These are short finless bodies that have the engine, launch lugs, and usually a streamer for recovery. They attach to the glider using some sort of hook system, so they carry the glider up during boost then at ejection kick backwards to separate from the glider. Spooler Pop-Pods. Sometimes, the shock cord or streamer on a pop-pod gets hung up on the glider, causing a tangled “Red Baron” descent to the ground. The “Spooler” pop-pod design eliminates shock cords and delays streamer deployment until the pod has left the glider. It works by having the streamer rolled up (spooled) inside so it cannot deploy until after the nose section has been ejected off (the nose tumbling down safely, usually painted a fluorescent color to aid in finding it). Pod Hooks. Various kits and plans show different types of pod hook or pod attachment methods. Unless the glider is somewhat unique, you can usually use your favorite pod hook method on any given boost glider plan as long as you maintain the pylon height between the top of the fuselage and the pod tube (on most gliders, the pylon height is 1/2″). CMR Manta Hooks. The old CMR Manta kit used a hook system that proved to be simple and mostly universal. It is easily duplicated by using spruce for the hooks and thin plywood or G10 fiberglass sheet for the side plates. See the drawing below. Apogee Universal Glider Hooks. A single cast part design which has a hook and a slot, which fits with an identical cast hook and slot part (see drawing at right). One is glued to the pod, and one is glued to the glider (these were originally developed for the Maxima glider kits). Any glider can fit any pod, since the hooks are all identical.The hooks are sold by Apogee Aerospace. Building Gliders. Ed LaCroix created some fantastic instructions for the Maxima A Boost-Glider kit. The instructions are for an “A” model, but the building tips and trimming tips are useful regardless of what size of glider. Trip Barber’s D-Light B/G plan (see the files below) also has a good description of glider construction, sanding an airfoil, tissuing, dethermalizers, and even a launcher. So even if you do not build this model, it is worth reading for techniques and ideas. A VERY nice sanding block, useful for gliders, helicopters, and any rocket really, is an all-metal 2-piece clamp-type sanding block made by Red Devil, carried by most Ace Hardware stores (look near where they stock sandpaper). It has a 1/8″ foam rubber backing sheet, which should be removed since it allows rounding things too easily in 3-D when you usually want to shape in 2-D at a given time (as with a wing). So, remove the rubberized portion. That sanding block holds a 4.5 x 5.5″ sheet of sandpaper (quarter of a 9 x 11″ sheet), with a 3.5 x 4.5″ sanding surface area on the block. This works far better in most cases than a narrow sanding block. Of course, the wings (or fins) should be shaped and finished before they are glued to the fuselage or model. When doing very rough shaping for wings, 80 to 120 grit sandpaper is good for grinding off a lot of wood in a short time. Don’t over-do it though by sanding off too much. Next use a finer grit like 180 to 220 for finer shaping. Beyond that, 280/320 paper, is sort of a cross between final shaping and setting up for a final finish. A final finish for bare balsa is sanding with 400 grit paper. Get the “black” type wet or dry sandpaper, it sands better and lasts longer than the reddish types. If you use any clear dope, use 320 to 400 grit paper before and after. Glider Finish. Never use paint on a contest type glider. For newer fliers, no finish is usually fine. You don ‘t want to weigh the model down too much and maybe having warpage problems. If you want to improve the finish, use some thinned clear dope in one or two light coats, sanding before and after with 240 and 400 grit sandpaper. The idea it not to add weight or cause the wood parts to warp. Coloring. OK, so bare balsa (even with clear dope) is not easy to see in the air or on the ground. Use a large black magic marker to color the bottom of the wing and tail surfaces black, as black shows up against the sky pretty well. Use a large red or orange magic marker to color the top surfaces. If you can find true fluorescent markers (not to be confused with wimpy fluorescent highlighters), an orange or red/magenta fluorescent color is highly recommended. Glide Trimming. It is an understatement to say that it is very important to trim the glider to glide properly. It’s not easy to describe just how to do so. One mostly universal tip is to have the tail of the glider and the wing to NOT be parallel to each other (there should be slight postitive incidence). There ought to be a little bit of “up elevator” angle in the tail, relative to the wing, to make the nose pull up a bit. Some plans/kits may be quite specific, and in those cases go with what they say. Note that free flight model airplane experts sometimes prefer zero incidence, but they are deeply experienced (usually) to have just the right touch and experience to get away with it. One of the simple ways to achieve slight up elevator effect (without adding too much) is to build the model zero-zero (wing and stabilizer parallel to each other), then warp the trailing edge of the stabilizer up. Make sure that the fuselage itself is not warped “down” – if it is warped at all, better to be warped “up” relative to the wing and stabilizer. Kevin McKiou’s Basics of Design and Trimming of B/G’s and R/G’s. Items 1 through 5 are useful only if you are designing your own glider, or modifying an existing plan/kit. Items 6 thru 9 are useful for trimming gliders for optimum glide performance. Dave Newill’s article below on trimming gliders. Ed LaCroix’s instructions for the Maxima A B/G have trimming tips. The instructions are for an “A” model, but the trimming tips and some other glider assembly tips are useful. Launching. Set up the glider on the pad so that it faces into the wind. This means the wing bottom faces upwind, and the wing top faces downwind. Actually the dihedral effect will usually try to make the glider face that way. 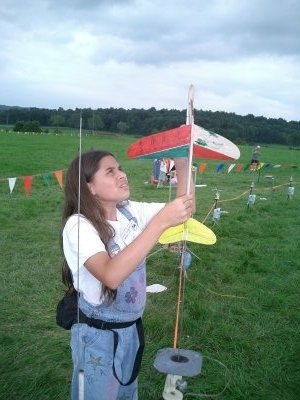 Apply a flag of masking tape to the launch rod, so the flag holds the pop-pod high enough for the glider tail to not be touching the bottom of the launcher. Some people prefer to make their own glider launcher that has the launch rod mounted onto a 3/8″ or 1/2″ dowel, so that the whole rod can be used for guidance. A classic launch problem is for the micro-clips to fall at ignition to grab onto the glider wing or tail, causing damage or even disaster. Some prefer to tape the clips to the rod so they can’t fall, which is effective but a bit messy. Others like to use an umbilical approach. They arrange for a separate launch rod, dowel, or other structure to hold the micro clip wires away from the glider, so that when the clips fall they will not fall straight down, but will swing away in an arc from the glider. A simple umbilical is to use a piece of 1/4 x 1/4 spruce 18″ long or so, and cut the bottom at a very sharp angle that is about 30 degrees from vertical. Then glue a launch lug to the angled part. That way, the spruce umbilical can be slipped over the launch rod, umbilical angled at 30 degrees from the rod, ready for the micro-clips to be attached to it. Put your name on it, since the next person to use that pad will probably want to remove your umbilical. Boost gliders are generally draggy and often delicate, with the thin lightweight aerodynamic surfaces tending to “shred” if they reach too high a boost velocity. Because of their drag they do not coast very long, so you usually need a short delay time on the motor so they are not headed downward at ejection — this is hard for a glider to recover from into horizontal gliding flight. You also generally want a motor with a lower average thrust to spread the total impulse out gently over a longer period of time and avoid reaching the “speed of balsa” during boost. The MIT Competition Notebook has many B/G and R/G plans for a wide range of motor sizes. Many other plans are provided in the files below.